In one of the biggest marches and rallies in Wisconsin history, more than 100,000 people participated in this year’s May Day in Milwaukee. 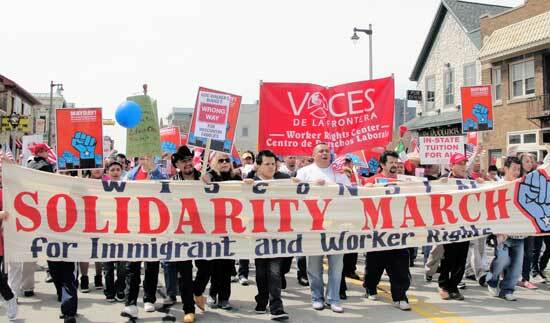 The action was sponsored by the immigrant rights organization Voces de la Frontera and endorsed by the Wisconsin State AFL-CIO and numerous other labor, community and youth organizations. Participants’ demands included legalization now; no Arizona racist copycat legislation in Wisconsin; keep in-state tuition for immigrant students; and no union busting in Wisconsin or anywhere in the United States. Labor delegations included the Service Employees union, the Milwaukee Teachers Education Association and the American Federation of State, County and Municipal Employees. Members of many unions attended, including the International Brotherhood of Electrical Workers and the United Auto Workers, including a member of UAW Local 833 at the Kohler Company. At the main rally, historic solidarity was displayed among immigrant rights groups, organized labor, and youth and students. Among the speakers were Christine Neuman-Ortiz, executive director of Voces de la Frontera; Richard Trumka, president of the AFL-CIO; Mahlon Mitchell, president of the Wisconsin Firefighters Association; Michael Rosen of the American Federation of Teachers Local 212; Phil Neuenfeldt of the Wisconsin AFL-CIO; and numerous youth activists from Voces de la Frontera youth organization. Other student organizations such as UWM Occupied (the group occupying a portion of the University of Wisconsin-Milwaukee Student Union) and Students for a Democratic Society in Wisconsin participated. Speakers denounced the racist attacks against immigrants of color and the attempted union busting in Wisconsin and around the U.S. and pointed to the banks, corporations and Pentagon as the real enemies of poor and working people. Participants came from all over Wisconsin on buses and car caravans. Workers also came from other states to show their solidarity. Delegations from the Michigan Emergency Committee Against War and Injustice, the Moratorium NOW! Coalition and Workers World Party came from Detroit. After the May Day march and rally, a group of activists participated in the annual ceremony in the Bay View area of Milwaukee marking the 125th anniversary of the May 5, 1886, tragedy in which the state militia shot into some 1,500 workers marching for an eight-hour day, killing seven in front of the Milwaukee Iron Co. rolling mill, then Milwaukee’s largest manufacturing plant. There was also a May 1 march and rally at the state Capitol in Madison. For more information, updates and upcoming activities: www.vdlf.org; www.wisaflcio.org; wisaflcio.typepad.com; www.defendwisconsin.org; www.bailoutpeople.org.